Abigail Kampmann is all about people, taking care of them, that is. References to that are woven into a conversation with the co-founder and CEO of Principle Auto Group. “Our key to success has been great people,” Kampmann tells Automotive Buy Sell Report. Based in San Antonio, TX, Principle has seven franchises at six locations. The franchises include Infiniti, Volvo, Mini, and two BMW stores in Texas as well as Toyota stores in Tennessee and Mississippi. In 2014 Kampmann’s father split his dealership group between Kampmann and her brother. She received a Toyota store in Memphis, TN, BMW-Mini of San Antonio, and Volvo of San Antonio. Those stores were the basis of Principle Auto group, which Kampmann founded along with Mark Smith, a fellow Texan and classmate in the Harvard Business School’s annual Young President’s program. Smith had previously worked for Dallas-based Sewell Automotive Cos. Smith is president and COO of Principal Auto. Tony Chase later came on board as an investor. The group was awarded an Infiniti open point in Boerne, TX in 2015. In 2016 it bought a Toyota franchise in Clarksdale, MS and a BMW store in Corpus Christi, TX. The Clarksdale, MS Toyota store will be moved to a new facility in Hernando, MS in 2019. The Corpus Christi BMW store will also be moved to a new facility at another location in Corpus. 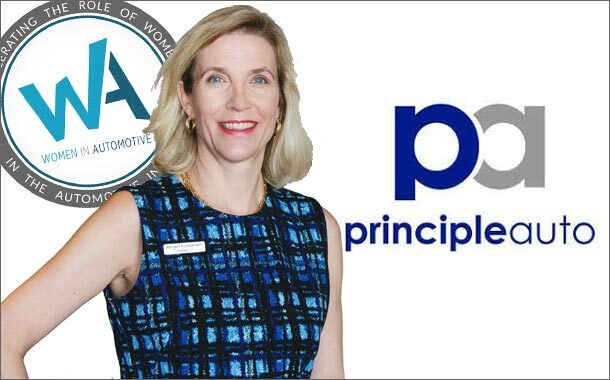 Principle Auto’s purpose statement is: “To be a trusted caring friend helping people move through life in a sustainable way.” That belief has been put into practice myriad ways since the group’s founding. She and Smith flew to Memphis to inspect the Toyota store in 2014, relates Kampmann. It was open seven days a week until late in the evenings. They changed the hours to a 7pm closing six days a week, closed Sundays. “We got letters from customers thanking us for taking care of our employees,” says Kampmann. The group puts its money where its mouth is. When remodeling the Volvo store in San Antonio, where temperatures often top 100F in the summer, they put air conditioning in the service area, as well. With fixed operations now a crucial part of any dealership’s bottom line, that helps the Volvo dealership find and retain good service technicians, though that wasn’t the purpose. The group also has a “university” offering classes addressing both personal and professional topics, from financial literacy to how to deal with people. Attendance is mandatory. “I pay for (employees) to sit there,” says Kampmann. As a woman in a still-male-dominated industry, Kampmann aims to support her women associates with policies such as flexible hours and alternative pay plans. Keeping women in the dealership business “is really quite a challenge,” she says. With Millennials, presenting a clear career path is helpful, says Kampmann. New employees attend a Principle Practices class, taught once a month. Attendance at those classes is growing along with the group. Between herself and Smith, “we have quite a history” of experience with different brands, says Kampmann. The group is always interested in adding more Toyota stores, or a Honda franchise, she says. They like to be in bigger cities. And in pickup-loving Texas, “we would like to represent somebody with trucks,” says Kampmann. Growth brings more than just incremental sales and service business. It also helps the group negotiate better contracts with vendors, she adds. The group has some 500 employees right now. Reaching 1,500 would give them good bargaining clout, says Kampmann. Abigail Kampmann surrounds herself with yes men. Anyone else is pushed out. Their guiding principles sound great but they are not lived or practiced.